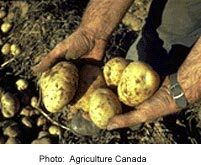 (8 May - Cropchoice News) -- Monsanto has closed its east coast GMO seed potato operation. The company is abandoning its Crystal, Maine plant, which opened in 1992. In its place, former employees are launching a new non-genetically modified seed potato company called SeedPro. The Crystal facility, operated by Monsanto potato subsidiary NatureMark, had been producing GMO potatoes with Bt and RoundUp Ready genes. Quoted by the Bangor Daily News, NatureMark's former seed operation manager Dave Hammond said the GMO potatoes hadn't worked out because farmers "weren't buying it because their customers wouldn't buy it." Varieties like Newleaf Atlantic and Newleaf Superior were intended for fields from Florida all the way north to Atlantic Canada. The Maine closure will leave Naturemark with just its Boise-based Idaho operation. Nationally, over the past year, farmers heard warnings from companies like Maine's McCain Foods that consumers were not happy with GMO potatoes. But food processor and restaurant worries went very public two weeks ago when the Wall Street Journal reported that french fry king McDonalds and other fast foods outlets have decided to not use GMO potatoes. Buyers including Idaho-based Simplot, the USA's biggest potato processor, then asked farmers not to bring them GMO harvests. The result will be a major downturn in GMO potato planting, although its too early to quantify. Last year, GMO potatoes accounted for 4% of US production. This year, it may be almost none. The good news is that most farmers paid attention to warning signs and didn't get caught by the spud meltdown. Almost all bought non-GMO seed potatoes for 2000. According to John Thompson of Potato Growers of Idaho, "the whole story came as no surprise to any grower here." Even though planting in western Idaho began as early as late March, long before the Wall Street Journal story, Thompson says "I'd be surprised if anyone got caught ... it really won't effect our industry."